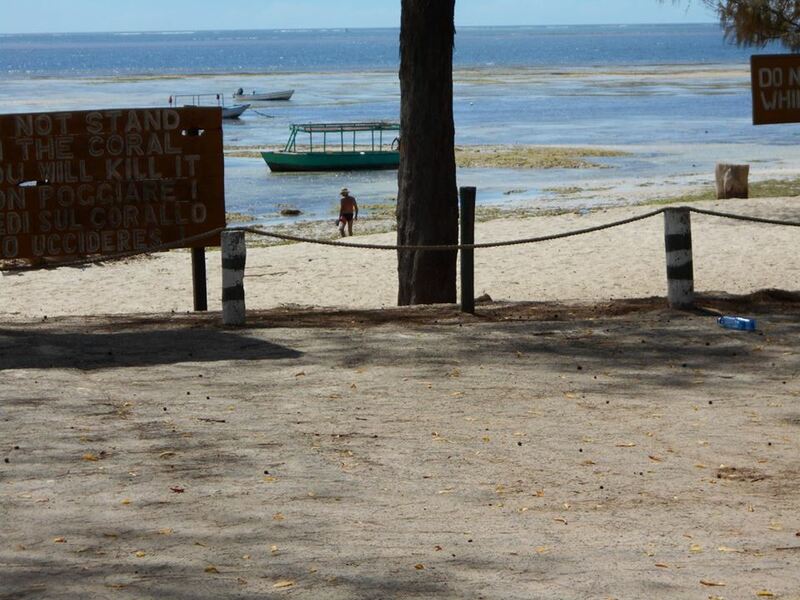 10 April 2016 – Kenya Airways changed the Malindi – Nairobi flight to 10 a.m. so I lost my last day in Malindi but because I am the luckiest girl in the world, I ran into Roger, the owner of the Driftwood, in the little bookshop at the Malindi Airport. He was buying a newspaper and I was buying When a Crocodile Eats the Sun by Peter Godwin. When Roger heard that I had a twelve-hour layover in Nairobi, he suggested that I go to the Ole-Sereni Hotel. It is very close to the airport and has a bar (The Waterhole) with a view of Nairobi National Park. A man at Nairobi airport asked me if I needed a taxi. I said, “Maybe”. I was trying to find if there was more to do in the departures part of the airport than there was in the arrivals, and sadly, it seemed that the two coffee shops outside at the airport were the only places to eat. I honestly could not imagine spending twelve hours there so Daniel Kariuki who works for Trova Viaggi Kenya, brought me to Ole-Sereni. My flight was scheduled to board at 10:20 p.m. and Daniel said he would come back at 8 p.m. to return me to the airport. I had lunch and then I went to the spa where I had aloe gently rubbed into my poor burned back. After returning to Singapore, I kept pulling strips of black/grey skin off my back which had bubbled up in the most grotesque way. When I first started pulling it off, I didn’t recognize it as my skin! Anyway, I have fallen in love again with Africa. It feels a little like having fallen for a lover’s cousin or, maybe even, brother. I never imagined that I would love East Africa the way that I love Southern Africa but I have learned that ‘never’ is a word I should never use. Saturday, 9 April 2016 – I had a breakfast of strong coffee with heated milk, a plate of fruit, and an omelette. It was raining and there was a blinding flash of lightning followed immediately by deafening thunder. Later, one of the housekeeping staff said that the lightning strike had killed three children. I really hoped the rumour was totally false. I headed to the Driftwood and bellied up to the bar. I ordered a Pina Colada. After a while, people who were attending the private function began to arrive. It was a fabulous party. I said my toast but got choked up so it was even shorter than what I had written in the airport waiting for my flight to Kenya. 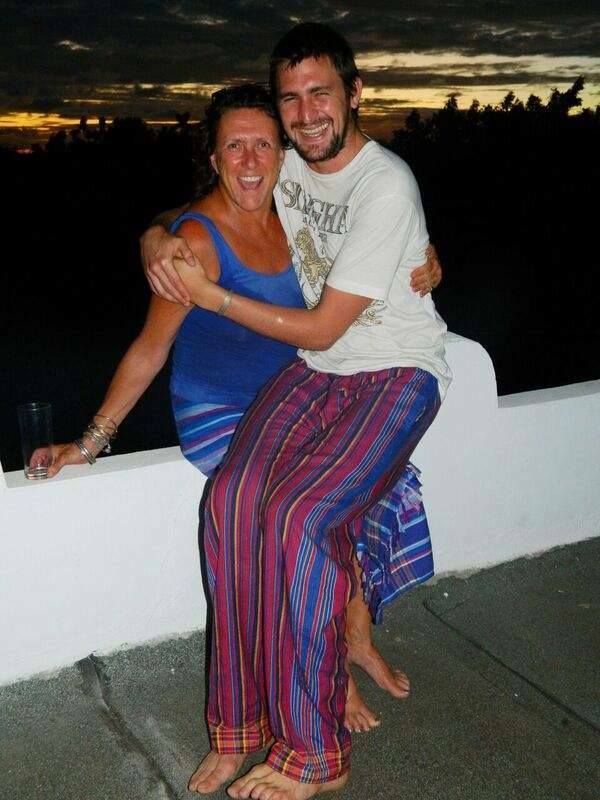 The notes in my journal read, “I met Krista in Maun, Botswana when she was just 23 years old. She was full of light. In the years since 1989, Krista has become a mother and a successful business woman. Her achievements have not made her arrogant, and her trials have not diminished her light. I would like to propose a toast to Krista – ‘Keep on shining!'”. Saturdays the Driftwood hosts a Mongolian buffet so there was lots of good food. Roger had hired a DJ so there was lots of good music. There was lots of drinking and dancing and it was lots and lots and lots of fun. At one point, I stepped outside and looked up; I nearly started to cry. I will always be awed by the African night sky. 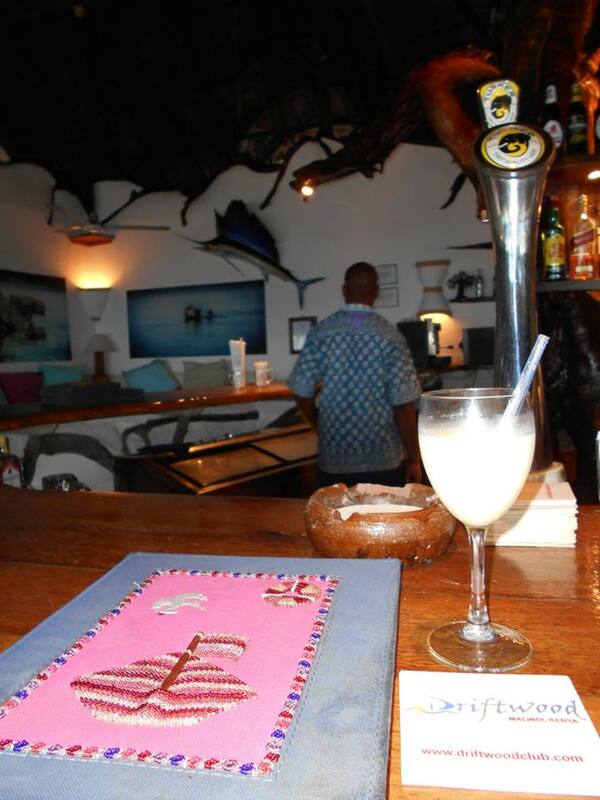 Friday, 8 April 2016 – After the dhow trip, we went to the bar at the Driftwood where some of the other ‘party people’ were gathered for drinks and lunch. I had eaten two samosas on the dhow so I was not hungry; I had a pina colada. There were a couple of regulars at the bar including Barry Koenecke whose work graces the walls of the bar. I walked the 500 metres from the Driftwood to the Silversand Residences where I showered and washed the sea from my hair, then I had a nap. I woke about an hour before sunset; I got dressed and walked over to Neem House. More people had arrived. This was the first ‘official’ day of the party. Ella’s invitation had stipulated that Friday’s festivities would begin at around 2 p.m. and that we should bring a bottle. I still had about half of the box of wine left. There was eating and drinking, dancing and laughing. Krista showed a slide show of photos that she had taken or that had been taken of her. They were brilliant! 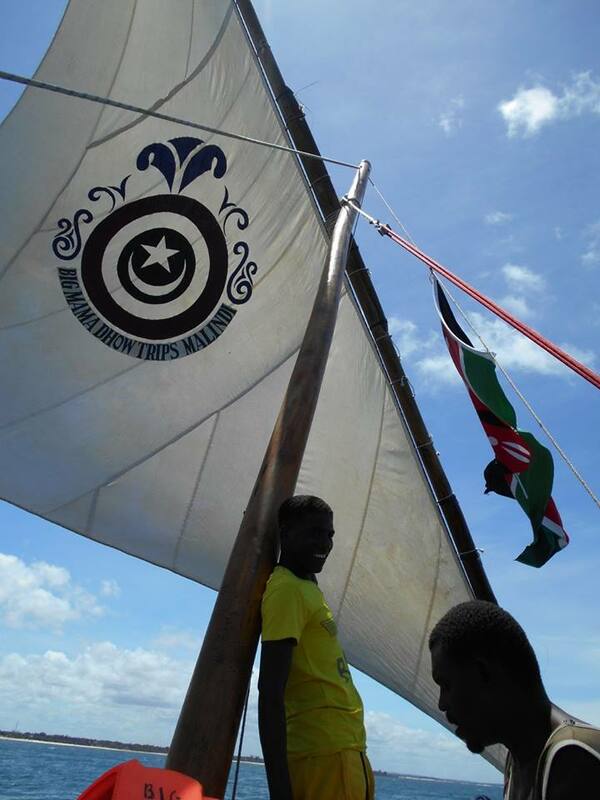 The highlight of day 8 of my trip was going out for a few hours in Malindi Marine Park on a dhow called Big Mama. There were five ladies including me and Krista; Roger, the owner of the Driftwood and captain of the dhow, and three crew members. 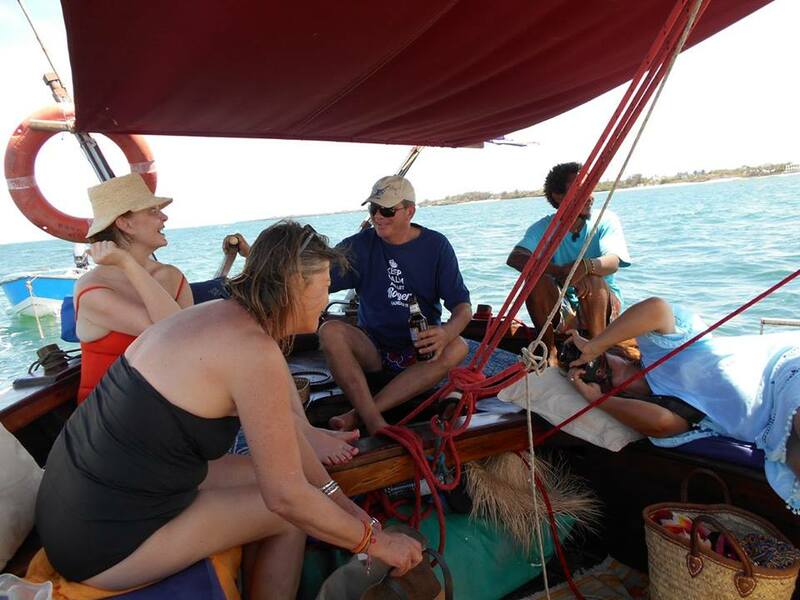 Often the dhow trips are a whole day with food and drink but we were having a little trip because some of us were not going to be able to join the big group on Sunday. We reclined on pillows while drinking wine or beer and eating samosas. We went snorkelling or ‘goggling’ as Roger calls it. It was like swimming in an aquarium the water was so clear. Small to medium sized striped fish swam all around us. We had a lovely few hours and I got way too much sun on my back and shoulders.